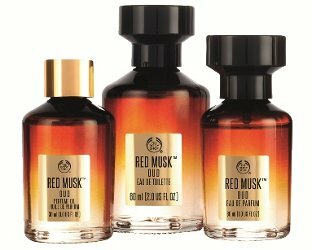 The Body Shop has launched Red Musk Oud, a new limited edition flanker to last year's Red Musk. A new, special edition fragrance for Eid with an intense and distinctly different scent, Red Musk Oud contains 100% pure, cruelty-free spiced musk with hot notes of cinnamon and tobacco. Additional notes include patchouli, cedar and olibanum. The Body Shop Red Musk Oud is available in some markets (not the US), in 30 ml Eau de Parfum, 30 ml Perfume Oil and 60 ml Eau de Toilette. I would indeed like to know how musk can be both pure and cruelty-free, unless by “100 % pure” they mean “100% completely synthetic”. In any case, at least it will be one oud that won’t be insanely expensive. Doesn’t all true musk go to Chinese medicine? Also there’s no Oud listed in the notes. An Oudless Oud.How post-modern! Agree with Merlin. Nobody can even afford to use real musk anymore. But it does make you wonder what they mean by “100 pure”. I guess, “100 pure non-animal”? Which is the same as saying “100% fake”, although I guess you could make an argument for vegetal musk notes like ambrette. I would have loved to try their rose oud/amber oud. However, this does sound good. Bath and BodyWorks will next introduce Tropical Vanilla Oud! I think you are putting ideas into their head! Banana Oud, Satsuma Oud, Honeymania Oud…Raspberry Green Tea Oud..and Brazil Nut Oud body butter…but I really want Passionfruit Oud lip gloss. Maybe I’ll actually be able to smell this one.